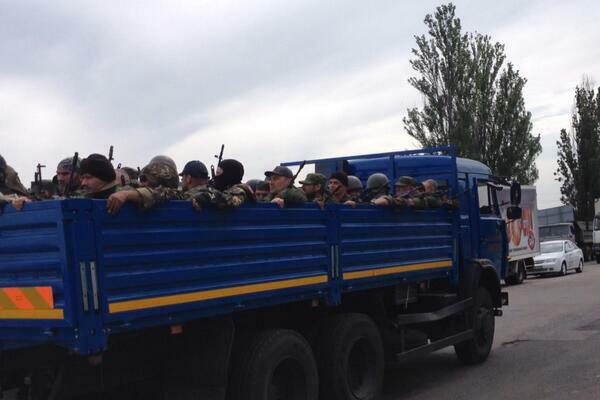 The 'peaceful unarmed (pro-)Russian protesters' are getting some brutal reinforcements from their Eastern neighbour. Battalion Donbas consists of civilians who are putting up arms in an attempt to repulse the invasion of oppressors coming from the East, because repeatedly the Ukrainian police and army fail to do so. Anybody who disagrees with the (pro-)Russians automatically is called a fascist, Nazi and/or is from Right Sector. As such Donbas battalion also is blamed for being Right Sector militants. And we never knew for sure how this exactly was. Ok, they were taking back the arms that were taken from Police and defected soldiers... Is that good or bad? Ok, that sounds good. When you don't want to work for the country that pays your salary... go! Could it be that such peoples militia can do what the army can't do? Wow!!! This is some serious business! These are not blood-driven, violence-adoring, ultra-nationalists. These are people who care for their country and want to fight for the protection and safety of it's people. Impressive! But, as with any pro-Ukrainian sound that is out there... like any given pro-Ukrainian demonstration that was oppressed violently, like the mayor of Kharkiv who almost was assasinated by a sniper bullet, like the body of Vladimir Rybak that was found in the river because he wanted to install a Ukrainian flag back on the city hall in Slovyansk... the Donbas battallion was becoming too much of an annoyance for the (pro-) Russian camp. But, all these previous examples, and there are many more, can easily be handled with by either aggressive civilians or by giving criminals guns. For the Donbas battalion more drastic measures are necessary, because they bite back. Another #Donbas battalion fighter found dead behind outbuilding. White hair. 3 Donbas dead in total I've seen. Commander's car shot up. #donbas battalion commander car shot up. blood trails. 3 #Donbas dead. 4 #Vostok dead. 1 civ. Start @ 5.40 in morning. Caught at breakfast. A so to speak 'very bad experience'. They said he was from Right Sector, because of the tattoos on his body. More likely it was one of their own. Now draw your own conclusions. What kind of sanctions are going to stop these guys? I better hope this is true. A report from the militia itself about the battle can be found here. No, that's a bullet exit wound. Getting to a heart makes a REAL mess.